(Bloomberg) -- Congressional Democrats issued subpoenas to Deutsche Bank AG and other banks to obtain long-sought documents indicating whether foreign nations tried to influence U.S. politics, signaling an escalation of their probes into President Donald Trump’s finances and business dealings with Russians. House Intelligence Chairman Adam Schiff said in a statement that his panel made the requests Monday in coordination with the House Financial Services Committee. JPMorgan Chase & Co., Citigroup Inc. and Bank of America Corp. were among firms that got subpoenas along with additional lenders, said two people familiar with the matter who asked not to be named because they weren’t authorized to speak publicly. Both congressional panels have been seeking Trump-related material from Deutsche Bank since Democrats took over the House majority in January. Schiff said the Frankfurt-based bank has been cooperative with the investigations and Monday’s request was a “friendly subpoena.” Such a subpoena is typically submitted when a firm is willing to hand over documents but wants a formal request first. 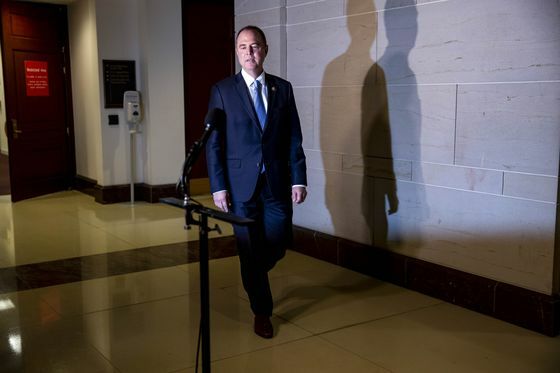 “This subpoena is an unprecedented abuse of power and simply the latest attempt by House Democrats to attack the president and our family for political gain,” he said in a statement Monday evening. Spokesmen for JPMorgan, Citigroup and Bank of America declined to comment. “These allegations are coming from the same Democrats who have claimed for more than two years that Trump is a Russian agent, so their conspiracy theories don’t have great track records," Jack Langer, a spokesman for Devin Nunes, the top Republican on the House Intelligence Committee, said in a statement Monday evening.